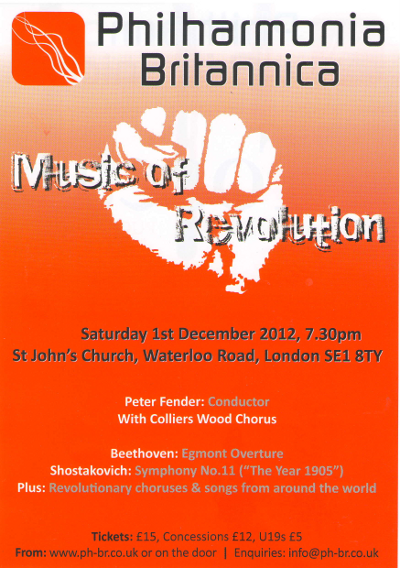 Once again we joined the Philharmonia Britannica to sing in this themed concert. It began with the gents placed behind the orchestra to listen to Beethoven's Egmont Overture, after which it struck up Peter Fender's orchestration of Ethel Smyth's The March of the Women and the ladies marched in from the back, singing the first verse. The other three were sung from the side, with the gents joining in with the last – well it was only fair! The ladies then joined the gents for Christopher's a capella (unaccompanied) arrangement of Nkosi Sikelel' iAfrika. This was followed by another a capella number, the world premiere of John Beeman's Fiat Lux, a rousing tribute to the Arab Spring. Finally, the orchestra joined us for Verdi's Va, pensiero, to round off the first half. The choir was able to retire to the balcony to enjoy the second half: Shostakovitch's 11th Symphony. This hour-long rollercoaster featured Christopher on bass drum and tubular bells, including the crucial last note, due to a shortfall in the percussion section!